What's the meaning of the phrase 'Cordon bleu'? High quality, especially of cooking. What's the origin of the phrase 'Cordon bleu'? French for 'blue ribbon'. The Cordon Bleu was the highest order of chivalry under the Bourbon kings. It has since been used for other first-class distinctions. The term has migrated into the language as a figurative acclamation rather than actual decoration for high quality, especially for chefs. "He meets with several Noblemen, some with a blew Cordoon." "Everybody rushes in, Princes of the blood, cordons bleus, abbés, housemaids." In 1827 a cookbook called 'Le Cordon bleu ou nouvelle cuisinière bourgeoise' was published in Paris. In 1895 a weekly newsletter called 'La Cuisinière Cordon-bleu' was first published. It included training via shared recipes and techniques written by professional chefs. 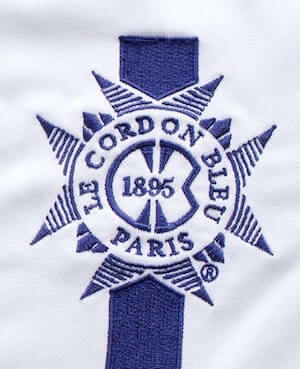 Cordon Bleu cookery classes began in 1896, at Paris's Palais Royal. It is also used more recently as an exclamation mimicking the similar 'Gordon Bennett'. This was popularized and almost certainly originates in the popular UK television comedy 'Only Fools and Horses', written by John Sullivan. The comic element in that was a running gag about the lead character's pretentious and hopeless attempts to affect sophistication by using French phrases. Along the same lines, the phase is the source of a nice, if sexist, joke. "My wife's cooking - Cordon bleu? It should be cordoned off."